Belly Dance Coin Hip Scarf (your choice of color): Shake in style with this high quality, imported chiffon hip scarf. Complete with intricate beading and beautiful coins, you won't just look good, you'll sound good. Approximately 60 inches wide and 12 inches long. Music CD: Harem: Club & Chillout Remixes. Some of the world’s hottest world dance DJs have come together to create a lush musical playground on the dancefloor or hookah lounge. Join Roger Abboud, Drumspyder, Giacomo Bondi, Petrol Bomb Samosa, and Jef Stott for the ultimate exotic club and chill out experience! 14 Tracks. This set is really nice! The fact that it came with the hip scarf as well as a dvd and cd is a GREAT buy! The workout is really effective I noticed the difference in my abdominal muscles after just a few days and now I do it every other night! The songs on the cd are very nice and nice to even just listen to. 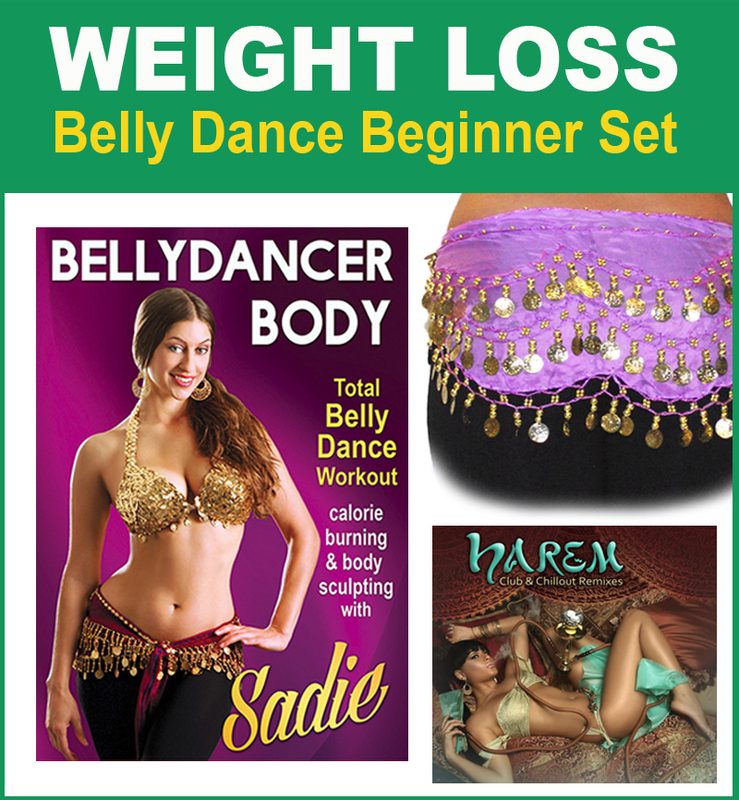 This beginner set has everything you need to get started belly dancing and losing weight. Sadie is an excellent teacher and takes you through the warm-up, various movements, and then puts it all together in a routine. Learning the routines is fun and the weight loss is an added bonus. I highly recommend this kit and Sadie.